Place a layer of ham on one slice of bread. Add a layer of cheese and cover with another slice of bread. Generously butter one side of the sandwich. Place a skillet over medium-high heat and allow to heat up. Add the sandwich to the skillet, buttered side down. 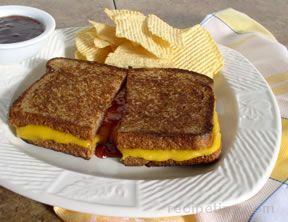 While the sandwich is being browned on the first side, generously butter the unbuttered side while it is in the skillet. When the first side is nicely browned flip the sandwich over and brown the other buttered side. Once both sides are browned, remove from the skillet, cut in half and serve. Continue to make as many sandwiches as needed to serve your family. You can cook more than one sandwich at a time if the skillet is large enough. 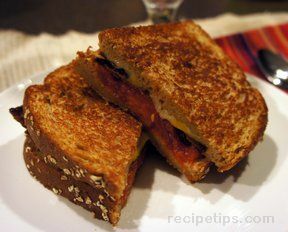 "Good sandwich for a quick lunch or supper. Next time I think I will use Velveeta cheese. We like that better for grilled cheese. 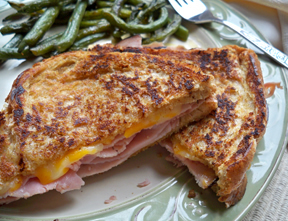 The Virginia deli ham gave the sandwich good flavor."